Want to learn EXACTLY how long to rest between sets to maximize muscle growth and long term strength gains? Then you need to read this article! When it comes to optimizing your training program, there’s a lot of variables that need to be considered. How much time you rest between sets is one of the more important variables yet is often overlooked. On one end of the spectrum are those who keep their rest periods as short as possible in order to sweat more, achieve a better pump, and experience more general satisfaction after their workout. And on the other end you have those who take their time with all of their sets and seem to barely break a sweat. But which one is better for muscle growth? Well, let’s start by taking a look at the pros and cons of each. The main reason why shorter rest periods of a minute or less are believed by some to be superior is due to the increased metabolic stress or the “burning” sensation that your muscles experience. And since metabolic stress was shown in Dr. Brad Schoenfeld’s 2010 meta analysis to be one of the main drivers of muscle growth, it makes sense that it would be the better option over longer rest periods. Seems like we found a winner, right? Well… Not so fast. As with many things, short rest periods come with a price – and it’s something you’ve probably experienced yourself. With a short rest period, you’re not going to be able to lift as heavy of a weight or perform as many reps as you would be able to after a long rest period. This means that with longer rest periods you’re able to achieve more total volume in your workout since you’re better rested for each of your sets and able to lift heavier or perform more reps during those sets. So as you can see, it’s essentially a competition between more total volume with longer rest periods versus more metabolic stress with shorter rest periods. Which one wins? Well to find out, it’s time to delve into the research. Luckily for us, researcher Dr. Brad Schoenfeld has recently published a study covering exactly what we’re looking for. 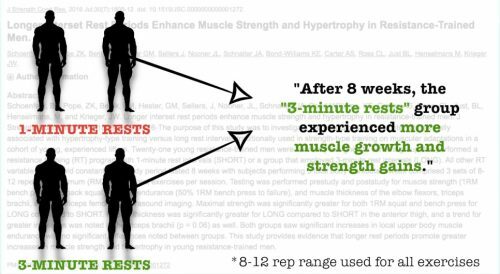 After 8 weeks, the long rest period group saw better muscle growth AND strength gains than the short period group. This was likely because the long rest period group was able to achieve more total volume during their workout since they were better rested for their sets. Therefore proving that total workout volume is a more important driver for muscle growth than metabolic stress – a finding that was then replicated in multiple other studies looking at rest periods. Now with that being said, theoretically you could just perform more sets with shorter rest periods to achieve the same amount of volume as you would with longer rest periods. BUT this is generally unenjoyable, likely takes even longer, AND as previously noted, will negatively impact your strength gains. So for these reasons, longer rest periods are likely the better option. But Exactly How Long Should You Rest For? 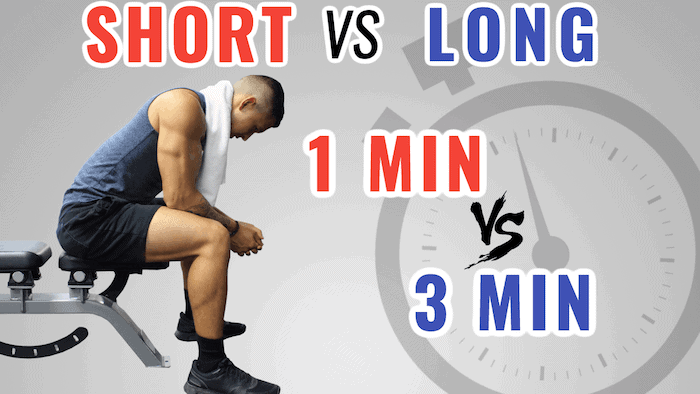 We know that long rests might be better, but exactly how long are we talking about? Well, this depends on several factors – but mainly the type of exercise you’re performing. For example, one 2016 study from the Journal of Strength and Conditioning Research examined the effect of varied rest periods on different exercises. The researchers found that roughly 2 minutes of rest was sufficient for single-joint exercises (like chest flies) whereas subjects responded best to at least 3 minutes of rest for heavy compound movements (like the bench press). And as you may have noticed, this finding is in agreement with Dr. Brad Schoenfeld’s study mentioned earlier. So for compound movements like the bench press, overhead press, squat, and so on, it would likely be best to stick to at least 3 minutes of rest between sets. And when using very heavy weight for lower reps (e.g. 3-5 reps), increasing your rest period to even more than 3 minutes might be ideal. In fact, in this case, 4-5 minutes of rest would likely be the best option for optimal strength gains. Whereas for your isolation exercises and other less taxing movements, sticking to around 2 minutes of rest (or slightly shorter if you feel adequately rested) between sets seems to be the best option. I should also note that so far no study has found any downsides associated with longer rest periods. This is besides the fact that your workout will take longer to complete of course. However, this does mean that if there’s a day where you feel fatigued and need a little bit more rest than usual, you can do so without being concerned about it negatively impacting your growth. Are Shorter Rest Periods Useless? Now this doesn’t necessarily mean short rest periods between sets don’t have any place in your routine. It’s just that right now it’s relatively unclear as to how to best implement them and whether it would be beneficial for you to do in the first place. In my opinion, they should mainly be incorporated for exercises that are relatively easy to recover from and reserved for later on in your workout. The added metabolic stress this creates may provide an added benefit. But as always, experimentation and trying things out for yourself is key. As you can see, longer rest periods are used for the main compound movements, especially when a low rep range is used as in the bench press. Whereas the isolation movements have shorter yet still adequate rest periods. And very short rest periods are reserved for the last exercise. Hopefully this example provides you with some insight as to how to incorporate rest periods into your own routine. Just keep in mind that although longer rest periods will provide less of a pump, less of burn in your muscles, and make you sweat less than shorter rest periods will, this should NOT be your basis as to whether the workout was effective or not. Muscle growth is very difficult to observe, but we do know that the most effective way to achieve it is by progressively overloading our muscles overtime, which as I discussed is best done with adequate rest periods. That’s pretty much it for this article. Let me know in the comments if you have any questions/concerns I can help you with. And show me your support by giving me a follow on Instagram , Facebook , and Youtube where I’ll be posting informative content on a more regular basis. Cheers! Any idea how this would be impacted by a superset with a different muscle group? For example: squats with bench press with 1.5 minute rest between each exercise (squat, rest, bench, rest, squat, …. ). This would basically give you 3.5 minutes of leg muscle rest between squat sets but you would still be working intensely and this could reduce your total workout time. I think it depends on the impact of the stress on the central nervous system versus the stress on the actual muscle groups. If the main issue is CNS, then the superset won’t help but it would help if the main issue is the stress on the muscle. Supersets can be used but they have their limitations. I wouldn’t suggest using them for your main compound movements and instead stick to using them for accessory or less taxing movements. Always enjoy your insights, Jeremy, and your videos are top notch! I’ve learned a lot from your articles. Thanks for doing them. I have a question on rest period length. To save time I typically superset exercises. For example I pair chest and biceps in one workout, so I might be combining dumbbell incline press with preacher curls and then rest a minute between supersets. So when we talk about the rest period, are we talking about rest for the entire body or just rest for a particular muscle group? In other words, is the time I’m doing the preacher curls (40-60 seconds) part of the rest period for the chest? Typically it’s rest for the entire body. The problem with supersets though is for example the biceps are still working during the incline press, so by fatiguing them with preacher curls you may actually be affecting your pressing strength. I think they should be reserved for certain movements – will make a future article/video discussing this. Do you always train with upper and lower body routine or sometimes with split routine ? As of late, upper/lower variations. I highly value your opinion and would love to hear back from you. Thanks a ton dude, my training really picked up since I started implementing your advice. Yup, that’s what I personally do. And 30 pounds of muscle gain in 18 months is great! Do you know about the rest time between sets if you want to burn fat and NOT grow your muscle? Hello Jeremy, first I want to thank you for your videos because lately I’ve been training with the exercises you suggest and I’ve been feeling like less of a newbie although I’ve trained for about a year now. I currently split my workouts into chest and tricep, back and bicep, lower body, shoulder and tricep doing 4 exercises of each muscle with a total of 8 exercises per training. Do you think I should switch to upper lower split? My main worry is that I won’t work my muscles enough since I’d only be doing 2-3 exercises of each muscle per week. I would switch to upper/lower – the ones I have up. And focus on progressing them. What about walking endurance training? I’m preparing for an 11-mile hike. I’m adding 3/10 mile every other day to the distance I’m walking. But how should I break up that time/distance for optimal benefit? We have a universal gym in our neighborhood clubhouse. How does this rest interval “translate” into different parts of the universal gym equipment? Shorter rests would be needed. Generally speaking, about how much time do you spend in the weight room on lifting days? You’re super jacked, but the workouts you’ve laid out don’t seem like they’d take all that long.